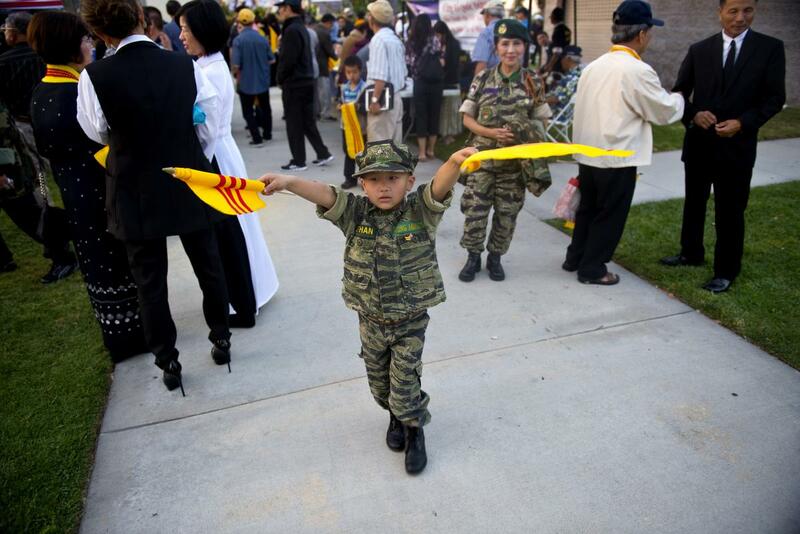 WESTMINSTER – Thousands of people converged on Little Saigon’s Sid Goldstein Freedom Park Thursday – 40 years to the day that Saigon fell to communist forces from the north – to mourn the loss of South Vietnam, remember those who died during the 20-year war and hope for a day when the government there crumbles. 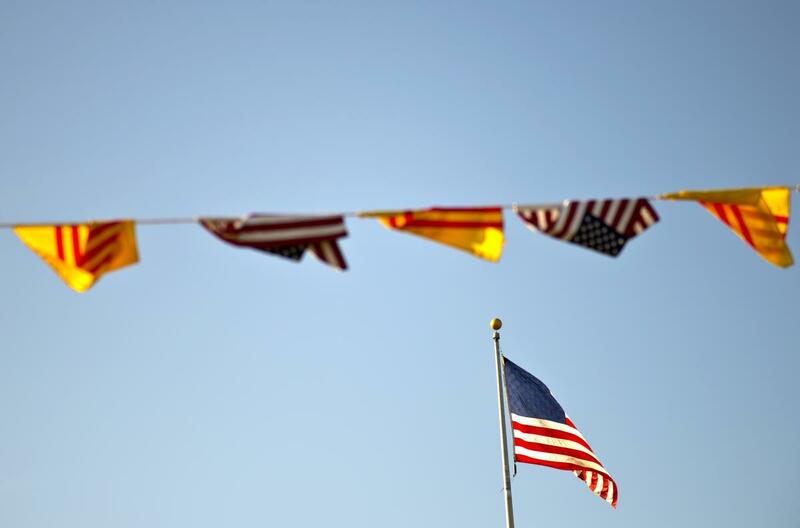 The South Vietnam flag flew at half-staff. Remembrance wreaths lined the pathway leading to the Vietnam War Monument. Former soldiers wore their fatigues. Some wept. 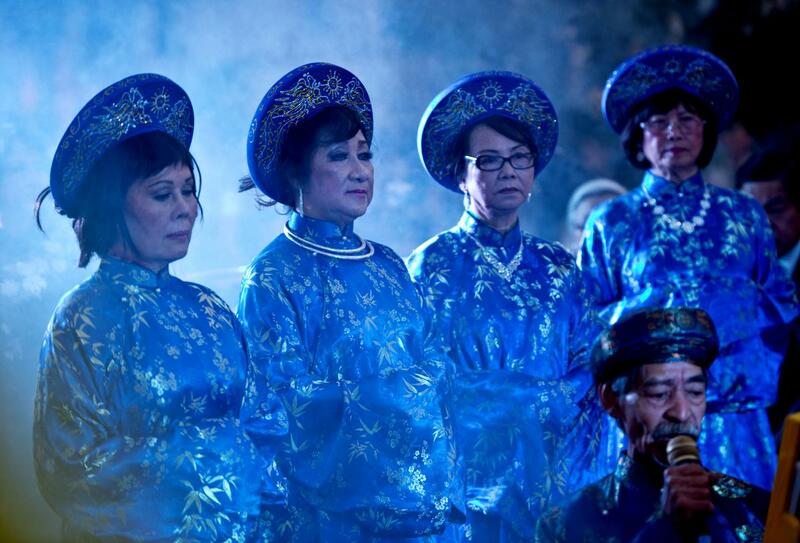 The 40th anniversary of the fall of Saigon has been a key milestone for the Vietnamese community in Orange County over the past month, known as Black April – a chance to meditate on what they lost in fleeing from Vietnam but also to cherish what they’ve built in America. 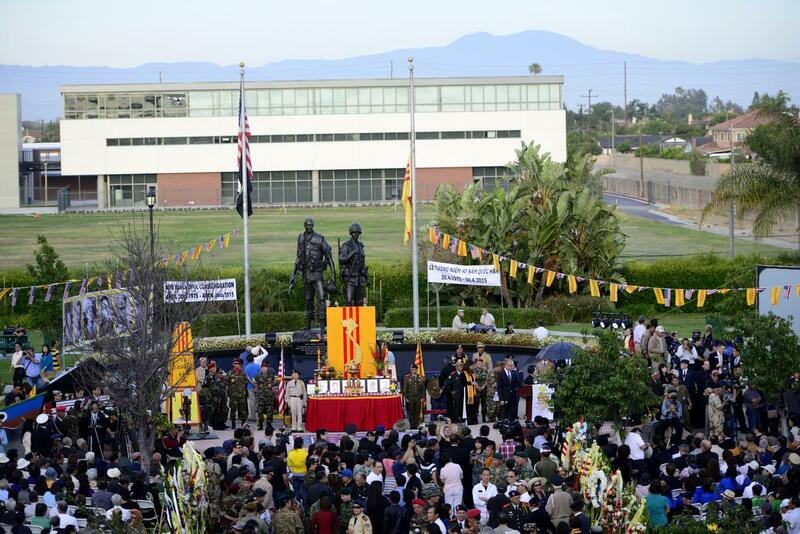 The Amerian and South Vietnamese flags fly in unison during a commemoration at Sid Goldstein Freedom Park for the 40th anniversary of the fall of Saigon. 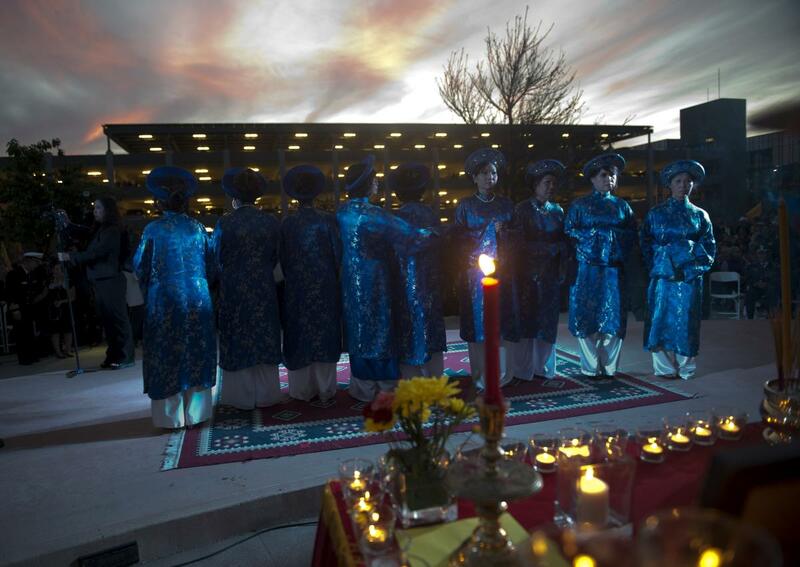 A candle lighting ceremony takes place during a commemoration at Sid Goldstein Freedom Park for the 40th anniversary of the fall of Saigon. 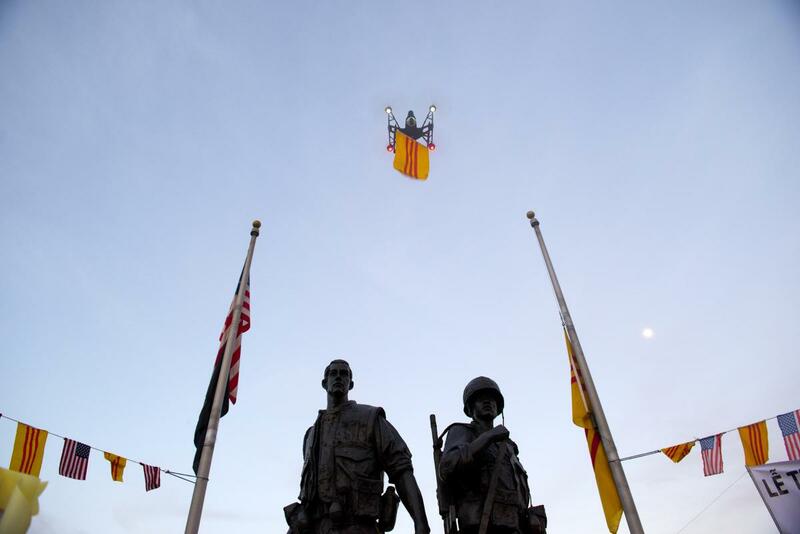 A drone carrying the flag of South Vietnam flies over during a commemoration at Sid Goldstein Freedom Park for the 40th anniversary of the fall of Saigon. 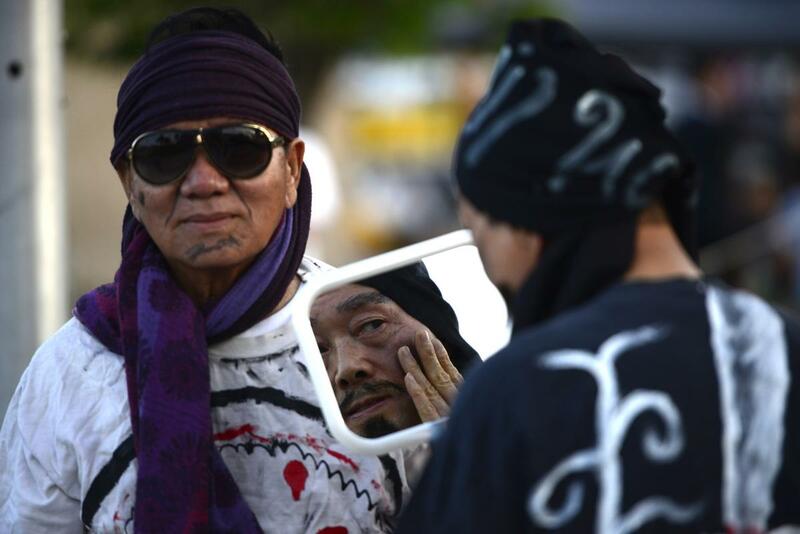 Performers ready themselves with makeup and a quick look in the mirror during a commemoration at Sid Goldstein Freedom Park for the 40th anniversary of the fall of Saigon. 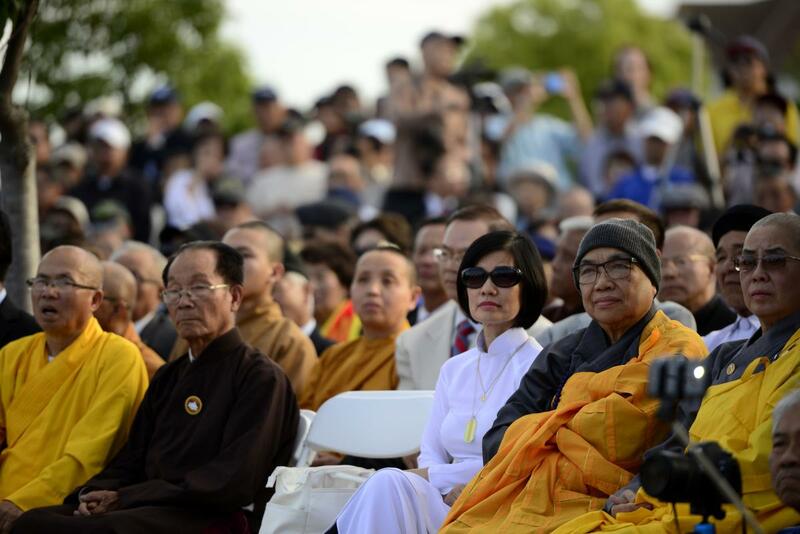 Hundreds of people watch as speakers talk during a commemoration at Sid Goldstein Freedom Park for the 40th anniversary of the fall of Saigon. 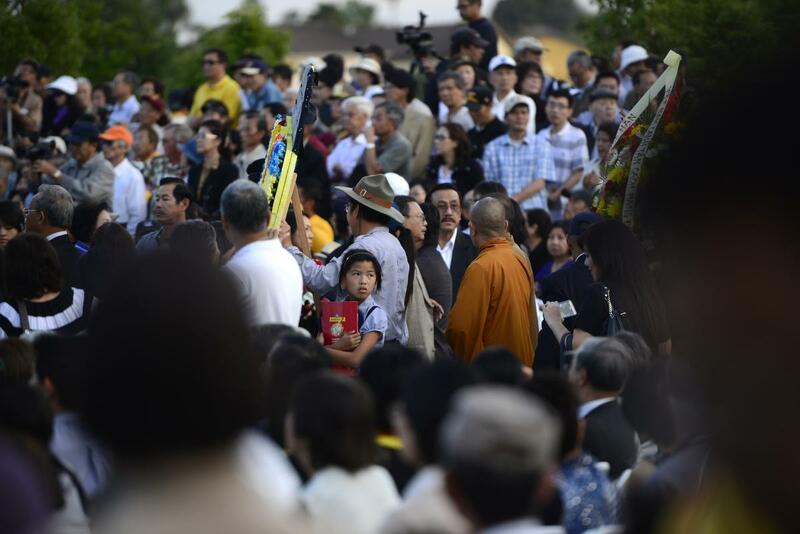 Hundreds of people listen to speakers during a commemoration at Sid Goldstein Freedom Park for the 40th anniversary of the fall of Saigon. Final adjustments are made to a banner before a commemoration at Sid Goldstein Freedom Park for the 40th anniversary of the fall of Saigon. Several hundred people attend a commemoration at Sid Goldstein Freedom Park for the 40th anniversary of the fall of Saigon. As the sun dramatically sets behind, women stand on stage for a candle lighting ceremony during a commemoration at Sid Goldstein Freedom Park for the 40th anniversary of the fall of Saigon. 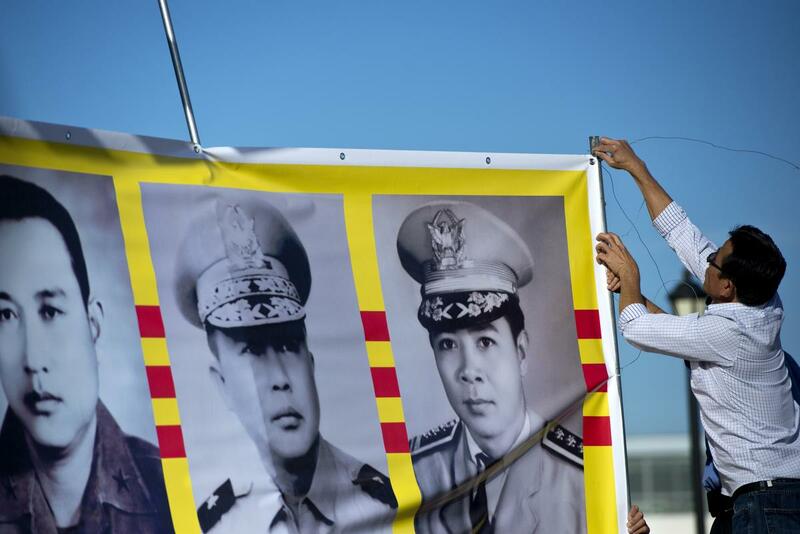 Ethan Chong Nguyen waves the South Vietnam flag while dressed in marine uniform during a commemoration at Sid Goldstein Freedom Park for the 40th anniversary of the fall of Saigon. A man holds a wooden map of Vietnam during a commemoration at Sid Goldstein Freedom Park for the 40th anniversary of the fall of Saigon. 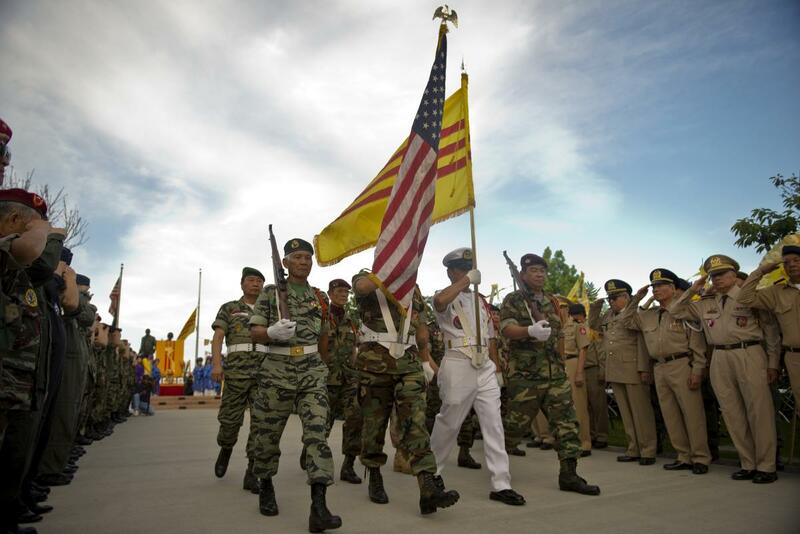 The South Vietnamese and American flags are marched down a row of dressed soldiers during a commemoration at Sid Goldstein Freedom Park for the 40th anniversary of the fall of Saigon. 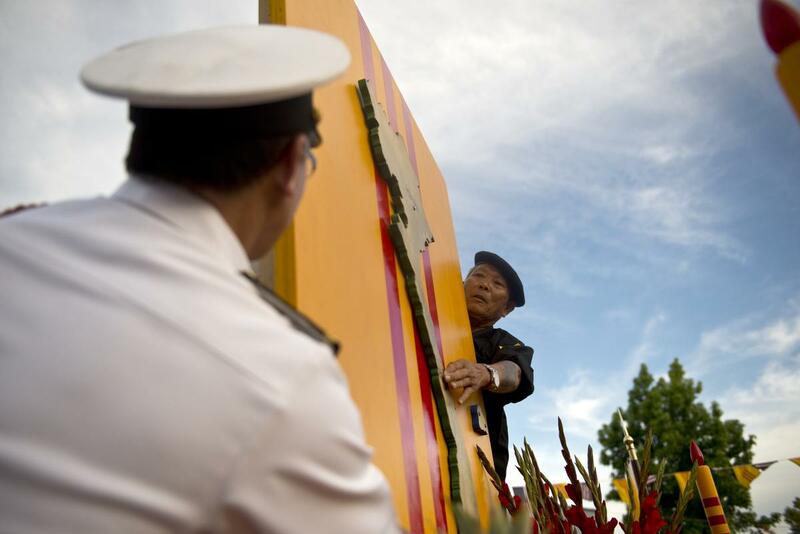 A wooden map of Vietnam is placed onto a flag of South Vietnam during a commemoration at Sid Goldstein Freedom Park for the 40th anniversary of the fall of Saigon. 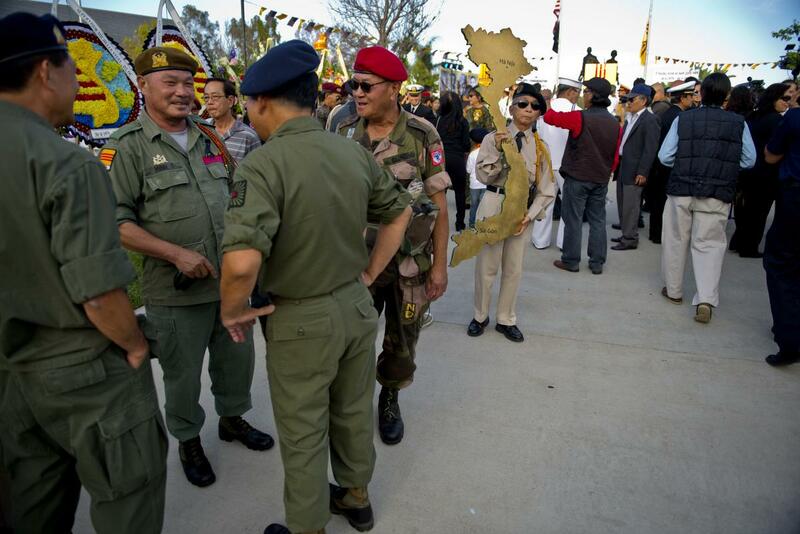 Performers conduct a reenactment of a scene fleeing Vietnam during a commemoration at Sid Goldstein Freedom Park for the 40th anniversary of the fall of Saigon. 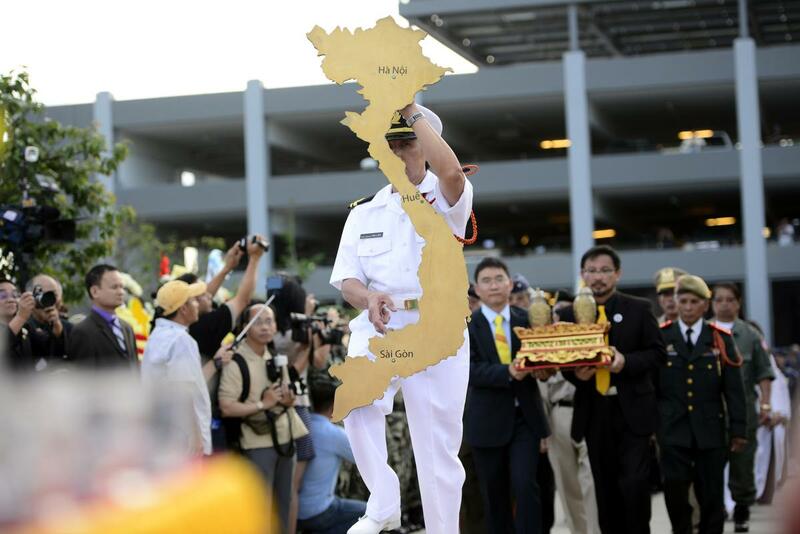 A wooden map of Vietnam is carried onto the stage opening a commemoration at Sid Goldstein Freedom Park for the 40th anniversary of the fall of Saigon. 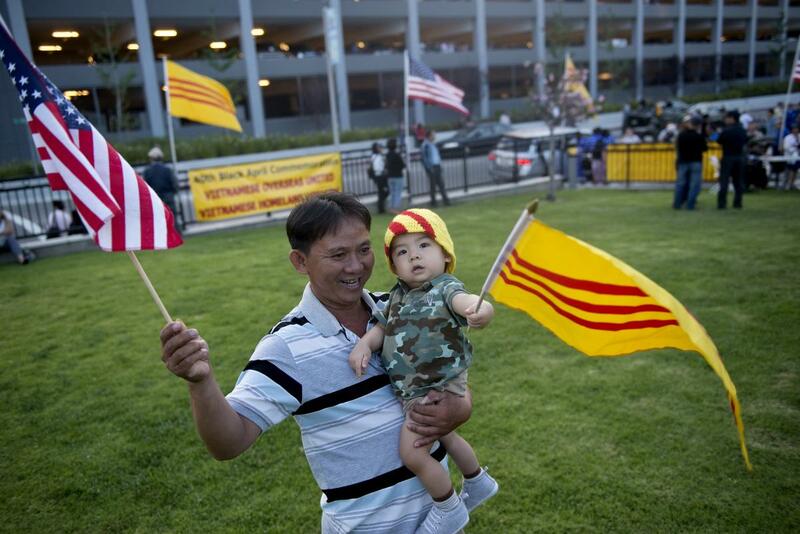 Khanh Le and Ethan Chong wave the American and South Vietnamese flags during a commemoration at Sid Goldstein Freedom Park for the 40th anniversary of the fall of Saigon.